Nobody but the scoreboard can dispute the fact that the Pens were the better team, but that's not what matters. The Pens played a hard-fought 1st period, had a major lapse midway through the 2nd, and then were barely unable to complete the comeback in the 3rd. There was a lot of hitting and chirping in the 1st but nothing all that serious that's worth noting. The second started out much the same way, but the Pens decided to take a 10 minute break and found themselves down 3-0. A quick timeout later and they were back to battling and got a timely goal from captain Sid to cut the deficit to 2. Sid struck again to start the 3rd and all of a sudden it was a game again. That was as close as it would get, because despite the Pens' best efforts they could not beat Hiller in the final minutes. There was a fast tempo throughout the game, and there was one fight between Deryk Engelland and George Parros but it was very short and there was no definite winner. Koivu's goal was huge but I have to say when Comrie missed a wide open net earlier in the game. Offense- B They had shots, plenty of shots. They couldn't finish, but the opportunity was there. Fleury- B His numbers don't reflect his performance accurately. He actually played rather well and made some big saves in the 3rd. Powerplay- B- So they finally scored!!! But they still aren't where they should be at. Malkin was used less at the point, so that's a plus. They still have to work on getting quality shots. Penalty Kill- ? I can't really accurately grade them because they only had to kill off one full penalty. They did, but that's not enough to give them a grade. That is a good thing, because it does show an improvement of discipline. -Sid must think he is the new enforcer. 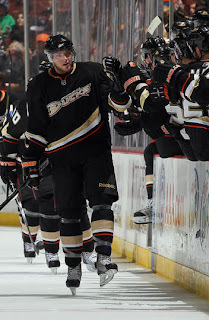 He was perfectly content to throw down with Getzlaf had the officials and teammates not gotten between them. It's great that he is playing with fire, but maybe a little more caution in choosing opponents? -Letestu and Goligoski are cooling off after a red hot start. Hope they get back on track soon. -By all rights the Pens deserved this one, but that doesn't mean that they can't get the next one. I don't understand why people are already mailing in the season, as there's a long way to go.